It is safe to say that anyone with Internet access or a television has heard about Mel Gibson’s recent tape rants. Needless to say, I could not resist posting these gems of hilarity. Apparently they have been floating around Facebook. 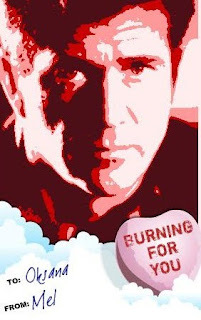 What can I say-- the Art of Mel. How is that for social commentary? 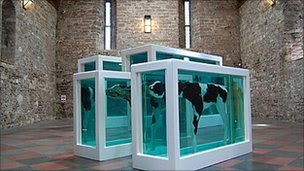 BBC reports that a promotional model cow located near Damien Hirst’s exhibit at Torre Abbey in Devon has been stolen “several times“ despite an increase in security measures. The model cow-- used to promote Hirst’s Mother & Child Divided-- has been found in various places-- normally “grazing“ near the exhibit location. However, the cow has not been found since the last theft. Since the advent of the Internet visual artists have been caught in a maelstrom between easy-- and accessible-- exposure for their art as well as the potential for images of their art to be used in ways they do not agree with-- in a sense, stolen. While it is true that the Internet has spurred a new form of art theft-- it has also paved the way for artists to gain exposure without the need for additional expenses that were warranted in the years before the World Wide Web. Thus, the desire-- easy exposure aside-- to protect ones work online is often a hot topic with visual artists from all walks of life and levels of professionalism. How has the Recession shaped the Art World? How has the recession-- and all the financial woes we have faced in recent years-- shaped the art world? Has the art market taken a step back or a step forward? Do emerging artists have an advantage or disadvantage due to the recession as far as making a name for themselves? Will we see an evolution-- or revolution- within the art world as to what is viewed as visionary? These are questions that I recently discussed with some of my associates. Is Art the Only Statement an Artist Needs? Within minutes of posting “Artist Statements say Nothing when Plagiarism is Involved” I received some criticism on Facebook. The artist-- who asked to remain anonymous for this article-- stated that the artwork itself is the only statement that an artist needs. He went on to say that various forms of art writing by artists should not reflect more than the artwork itself. The artist went on to suggest that other forms of art writing, such as exhibit reviews and the opinion of art critics, are “point blank useless”. It was clear that this individual is of the opinion that artists should only speak visually-- and that art writing only serves as a means of mental masturbation, so to speak. I’d say that art writing-- at least some of it-- is of “point blank” importance-- and that some of us love to get ‘off‘. Since my involvement with http://www.myartspace.com/ it is safe to say that I’ve viewed the artwork of thousands of artists-- probably more in the hundreds of thousands-- online. I can remember days when it was not uncommon for me to view the work of at least 300 artists on a routine daily basis-- a constant search for potential interviews. Needless to say, I've viewed a lot of artwork and have read many artist statements as Senior Editor. Thus, I have learned to key in on potential problems concerning the statements of artists and the manner in which they gain exposure online. I am gathering information to write about "Call For Entry” for visual artists. If you know of any contests, competitions or open calls with a deadline this summer or fall, send me the information. I am looking for museums, universities and brick and mortar galleries. Please no online galleries because MYARTSPACE has its own gallery devoted to selling works at NYAXE. After doing some research, I am hoping to add some information to my blog and update it monthly. I used to look through Art Week for the latest call for entry; but they have gone by the wayside as of February 2010. Now, with the ubiquitous internet there are more and more scams. I will work very diligently to get some viable information very soon. In the mean time, I do know that some places are better than others in regard to visibility. First of all, ask yourself why you want to show your work? Is it only to sell your work, or craving recognition, or just to get your art out there; "as we say in the art world?" Well, where is out there? If you look on the internet there are plenty of sites devoted to "call for entry" but most of them charge a yearly subscription. They aren’t too expensive but which one or two are the best? I had friend of mine go through all the trouble in the submission process just to get into a tiny gallery way out in the middle of a wheat field in Nebraska. Not that there is anything wrong with Nebraska; but getting your art into show, after all the hard work put into making the art, preparing it to show and shipping it off, it seems like you would want to show in a place where plenty of people will see your art work. Now, if you put in all that effort in making the art, getting it in order on CDs and DVDs, labeled, size/medium and all the other requests on the detailed prospectus, where are you going to show your work? It is always best to start close to home. If you are an emerging artist there are plenty of shows for artists who have just earned their MFA or have a limited number of shows under their belt. But for the people who have hit a ceiling and passed the emerging artist status, it becomes harder and harder to find quality places to submit work. I know a woman who made up almost 300 portfolios and took them around to galleries in San Francisco, Los Angeles, New York and Europe. She only got into one show and that was in Pacifica, California. Her work was great but no one cared to even look at it. She heard people laugh at her as she left a few of the galleries. I really felt bad for her. I don’t know what happened to her after she moved to New York but I hope she got off the ground. I know there are many ways to get work shown but I will stick to “Open Calls For Entry” and “Artist’s Call For Entry.” Some of the “calls for art” may state their desire to look at an artist’s work for an upcoming show. They may be looking for a certain theme or they want any genre of fresh art for an open call. Sometimes this work is shelved for future shows. They may be named, “call for entry” “call for art” “call for artist” but they all are requesting artist’s to send in examples of there work to their jury or selection committee. I am sure most of you already know this but I am just answering some of the questions from readers about this topic. I will start with the competitions I know myself, do a bit more research and hopefully I will get plenty of information from "out there." 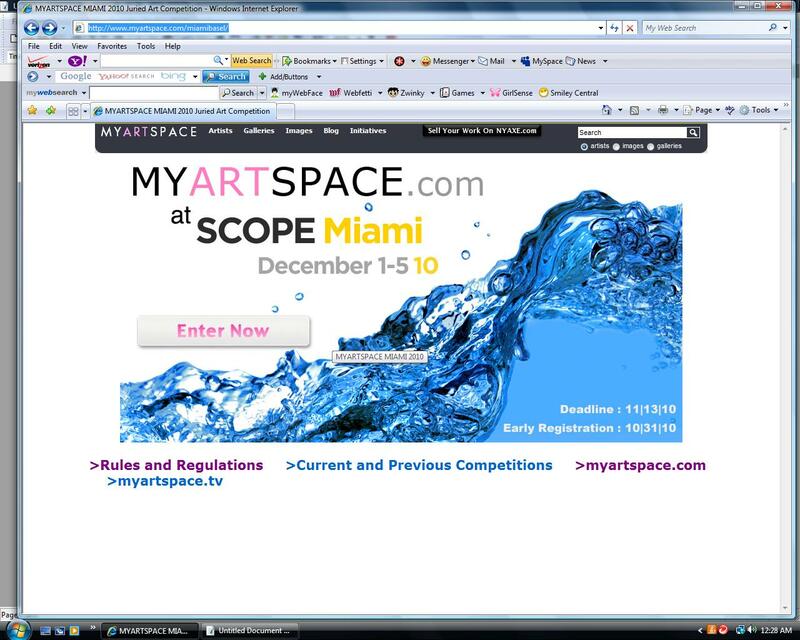 Of course I have to let you know about what MYARTSPACE has to offer in terms of competitions. 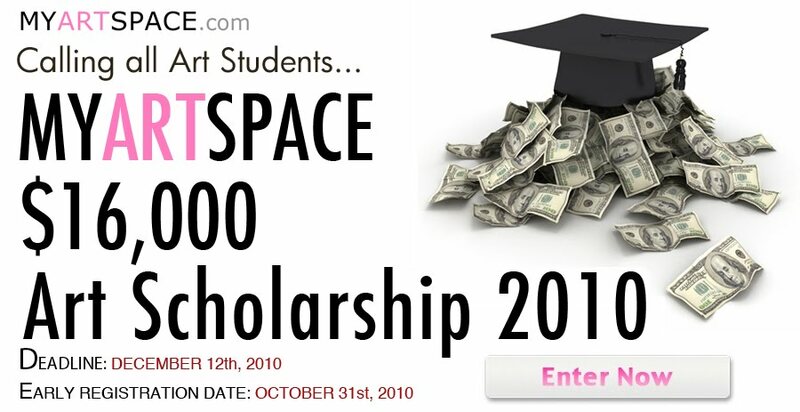 The Scholarship competition is very successful for students and a few different competitions are coming up. I will keep you posted. Let me know what you are interested in and what you would like to find out about art competitions. I want to let you know about a “Call For Entry” in San Francisco where years ago a colleague of mind won and was almost sued for slander. I will just leave that information at that and move on. Look over the prospectus and see if your art would fit in the category. APPLICATION DEADLINE: MONDAY, JUNE 7, 2010, 5:00 p.m.
May is a busy time for Universities. In the art world, the Master’s Thesis Fine Art Exhibitions is one of the most pivotal moments in an artist life. Millions of art collectors, patrons of the arts, curators, critics, other artists and friends descend on campuses to view the art of students just about to enter the competitive art market. Because these students have been studying innovative ideas, collaboration, style and refinement of their work for the last two or three years, their art may be on the cutting edge waiting to be to be scooped up by collectors. Students will use this work to contact galleries and competitions to start, or extend their art career. I looked up MFA Thesis shows and found a few in the Bay Area. The three I picked are not a reflection of the best art work in this area; but they are the shows I had time to visit, read about or view online. I did notice most of the artists did not have their own web page -- to easily access through their University’s MFA show web site. Or could I find them on any social web site. I believe having a place to share their art would be an important tool for student to learn in this age of social networking. It is a well know fact, if you want to start collecting art -- go to MFA Thesis Shows. Student artists are very interested in selling their art, at no commission to a gallery, for great prices. Don’t be surprised if you run into artist egos because these students are coming off a high where they were on top of their world. Nic Buron, Joey Castor, Chris Fraser, Dana Hemenway, Kija Lucas, Bobby Lukas, Monica Lundy, Kate Stirr, Adam Vermeire and Doug Williams. 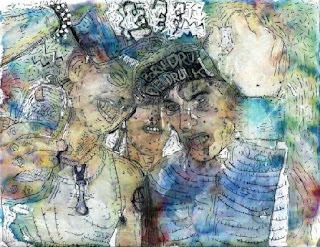 Monica Lundy's investigations of historical California criminals manifest, of women who were in prison, in a series of paintings and sculpture that explore identity perception in relation to systems of social classification. This body of work was inspired by prison archival photographs from the California State Archives in Sacramento. These oil and gouache portraits of female inmates and the application of wet clay to the gallery wall diluted paint that pools, bleeds, and separates as it dries, creates an effect of staining or erosion; or wet clay on the wall that leaves as evidence only a trace of what was there before. “Working in this way conjures mental parallels to the corrosive nature of time on material things,” Lundy said. Lundy has already had numerous exhibitions and has studied in painting in Florence, Italy. 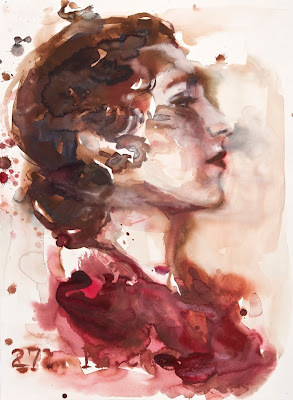 She received her BFA from The School of the Art Institute of Chicago. You can view more of her work at www.monicalundy.com. 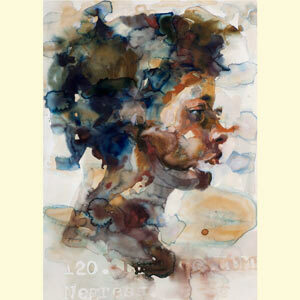 This work and the other 2010 MFA student’s work can be seen through the end of this month. If you can only make it to one show and really want to see a cross section of what’s happening in the contemporary art world you can’t miss the “San Francisco Art Institute MFA Graduate Exhibition, Vernissage. This show will feature work by nearly 100 artists graduating from the SF Art Institute this year. Artists include: Maia L. Anderson, Luca Nino Antonucci, Alexis Arnold, David Bayus, Pete Belkin, Pamela Belknap, Tyler Borenstein, Percy Cannon, Reece Camp Carter, Richard Bluecloud Castaneda, Carlos Castro Arias, Alma Chaney, Kim Cook, Christina Corfield, Liz Corman, Ian Coyle, Taylor Crawley, Nicole Crescenzi, Donald Daedalus, Xiao-long Dai, Tyrone Davies, Kate Dipietro, Emily Dippo, Stephanie Dodes, Mercedes Dorame, Jason Driskill, Sara Eliassen, Carrie Elzey, Rashin Fahandej, Catherine Anne Fairbanks, Laura Boles Faw, Michael Robinson Fleming, Ferdinanda Florence, Aryk Gardea, Lindsay Gardner, Brynda Glazier, Jono Goodman, David Marc Grant, Casey Gray, Robin Griswold, Ashley Harris, Lauren Hartman, Melkorka Helgadóttir, Michael Hilt, Chris Hood, Tsen-Chu Bamboo Hsu, Neil Jernstrom, Lindsay Jordan, Hyunsun (Yuri) Jung, Amelia Layton, Jack Leamy, Ko Woon Lee, Hava Liberman, Cathy Chih Lu, Christine Lund, Julie Mallozzi, Romy Leanides Mariano, Susan Alta Martin, Margaux McAllister, Christopher Walton McLean, Carling McManus, Sonja Meller, Nicholas Conrad Miller, Mimi Moncier, Amy Morgenstern, Robert Moya, Muistardeaux Collective, Crystal Am Nelson, Karl Nelson, Jennifer Odell, Ian Alan Paul, Eric Petitti, Scott Polach, Carissa Potter, Ernest Eugene Regua, Lina María Rincón, Eric A. Roman, Lisa Mitchell-Schmaltz, Jesse Eric Schmidt, Gretchen Adelia Schneider, Stephen R. Shearer, Daniel R. Small, Marta Spurgeon, Magda Stanová, Mary Jakse Strebinger, Jen Susman, Amy R. Sweeney, Michael Ten Pas, Angela Thornton, Krissie Tosi, Paulina Velázquez Solís, Kheng-li Wee, Cascade Wilhelm, Megan Wynne, Michele Wysocki, Rochelle You, Amber Jean Young, Daniel Yovino, and Eric Zeigler. Solis was born in Puebla, México but moved to Costa Rica, where she obtained her BFA in Visual Arts at the National University (UNA) in printmaking with teachers such as Adrián Arguedas and Rudy Espinoza. Her work is focused at the moment in the symbolism behind games and playful actions, using techniques such as printmaking, as well as video, animation and three-dimensional objects. In her thesis work she found discarded objects on the sidewalks in a couple of San Francisco neighborhoods. She copied the objects and printed them out on paper or on currency. She plans to go back to Costa Rica and find job that gives her time to do her art. She also wants to open a workshop-studio-art coop. She has also shown her work in such places as Casa de las Américas in Havana, Cuba, the Costa Rican National Gallery and the Museum of Contemporary Art and Design (MADC) in San José and the SUNY Gallery in New Paltz, New York. The Thesis Show for the Art Institute will be at Fort Mason. Gallery hours: daily from 12:00 to 6:00p.m. Seven emerging, prolific artists present new work in textiles, sculpture, painting, conceptual and information arts, photography and printmaking. Showcasing the creativity and diversity in the SF State Art Department’s rigorous, competitive three-year M.F.A. program, these artists all exhibit their works actively throughout Northern California. Bren Ahearn, Luke Damiani, Aaron Granich, Matt Kennedy, Taryn McCabe, Jeff Ray, and Holly Williams. Luke Damiani’s wood and metal sculpture presents as a statement on industrialism’s crude beginnings. These machines would have little use with today’s rapid farming practices. Along any highway in California old broken-down tractors, plows and carts can been seen rusting away. This work reminds me of a representation of the once thriving agrarian culture. Damiani say, "Machinery in the modern age augments human activities, making tasks easier to perform, or freeing up labor altogether. Prior to the materialization of machinery though, people imagined mythical machines that aided them in navigating the supernatural. Both realized and imagined machinery are indicative of man’s desire to invent forms that could provide freedom from the constraints of time and place." Damiani received his BFA from the California College of Arts & Crafts, Oakland before attending to San Francisco State University. He has worked as a gallery assistant during his time at college and will continue to show his work. Gallery Hours: Wednesday - Saturday 11 a.m. – 4 p.m.
After all the research I did through the internet I found it difficult to find accessible images of students’ work at University MFA Programs. The Master Thesis Shows' Art should be easy to find and the artists work displayed. I didn’t have all that much luck in the Bay Area finding good web sites. But I did find two from other states -- that go right to the MFA students’ thesis show. Why do most colleges neglect to have students work easily available to view on the internet? Shouldn't learning how to display their art on the internet be on the curriculum? There are too many unorganized, ugly, non-productive sites around that do more harm than good for the visibility of fresh art from the energetic group of recent graduates. Go to these sites to see if they are easy to look through. Emerging and established artist need to understand how to show their work through the World Wide Web. Someone has stolen Speperd Frairy iconic art, “HOPE.” But I don't think he can do anything about it. A web site is already dedicated to allowing people to add their image to the “HOPE” design to render an image similar to Frairy’s work. I was so excited I looked up who is using it and found an interesting mix of people joining in on the fun. It is sort of like doing graffiti art on the internet. 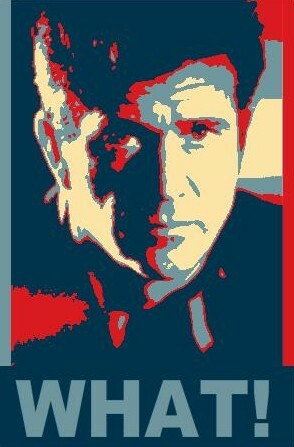 So go to http://obamiconme.pastemagazine.com/ and get started on your own piece of history. You will be immortalized. Some of the design templates reflect the “HOPE” poster closely and others just give it a hint of Frairy's work. The more I looked around the more I found uses of his work as a money making operation. An appropriation via an iconic piece of artwork. If you would like to see some more information on what you can do to get a copy of an artists work and mess with it, like painting a mustache on the “Mono Lisa,” see what Paste Magazine has to offer. "Paste Magazine launched Obamicon shortly before President Obama's inauguration in January. 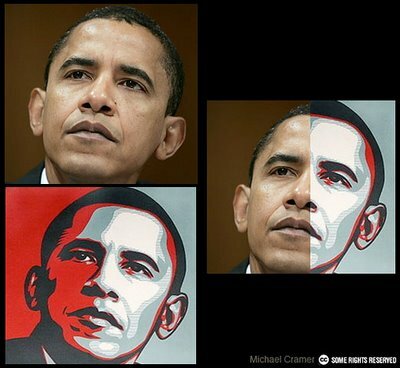 The site allowed users to make images of them in the style of Shepard Fairey's iconic "Hope" poster. The site received over a million visitors in its first month, with over 1.25 million webicons created to date. Iranicon is the third official webicon, following "Luvicon" and Obamicon. Paste has also produced webicons for Green for All and the Atlanta Hawks." I wonder what Fairey thinks about this? This magazine is raking in the bucks from advertizing because of the interest in this little project. Over a million webicons created. Now we have a new word for the dictionary webicons? Someone sent me an attachment of this band that has exploded the Internet with their music. The neo-punk-rap-rave-band Die Atwood (The Answer) has no respect. They not only took on the adoption of Frairy's work they use it for advertising for their music. However, Die Antwoord says they have no respect for anything political or commercial. Like punk and rap music, Die Antwoord spews its share of profanity at the audiences and airwaves. Some of the portrayals are sort of corny for me like their use of the Ninja. It is funny and goofy but some how it works. Their message is clear there language is not. I spray painted over a word on the poster to the left because it is one of the seven dirty words a journalist is forbidden to use (thanks George Carlin). Although it is not the same spelling as in our culture it translates the same. If you haven't guessed what that word is I can give you the first letter, f. It would give me a lot of joy to have left the word as it was, but heck just Google it. Some people are very offended by these words so we must obey the law or should I say perceived law. A bit of information on this band -- the members grew up in the same trailer park in South Africa and their music is about poverty, culture, hate and racism. Their use of English is difficult for me to understand. But I am sure I can guess what most of the words say. What I have seen is a group of people mimicking anything they can to get a response. Let me get back to the art work the band evokes. 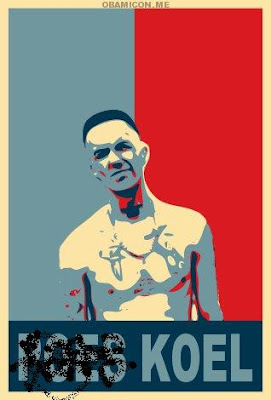 What is interesting, besides the uses of Frairy's “HOPE” poster, was their visual art in their videos, posters, and mostly from their fans. Their Facebook page http://www.facebook.com/DieAntwoord is set up for fans to comment, share photos and to display some of their own art work. It looks nothing like my family's Facebook page, by the way. Some of this work is very good but you have to sift through a lot of band photos to get to pieces like the one below of Yolandi. The artist is a fan and admirer from South Africa. It looks nothing like my family's Facebook page, by the way. 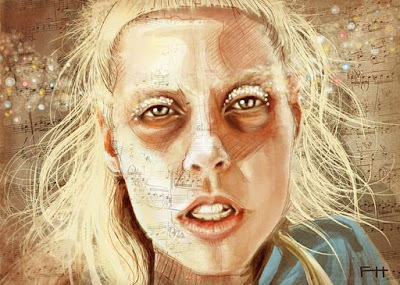 Some of this work is very good but you have to sift through a lot of band photos to get to pieces like the one below of Yolandi. The artist is a fan and admirer from South Africa. Just because the art is coming from the influence of music and it may be appropriated by armature artist. It could be classified into a genre of art much like Frairy’s graffiti art. The groups parody of contemporary genres of art and music. It funny and fresh. I can't say I am going to follow their current popularity on the "inter-web" Internet, but I do have a lot of questions about why they decided to use Frairy's work to portray their image. Maybe it just crossed the minds of the band members. Almost every aspect of this band is an appropriation. I am sure they would just say “F--- it. It is very important to note sometimes the truth is better told by artists. The issues of racism in South Africa runs deep. We in America my think we are century’s away from institutionalized racism; but are we? “As South Africa's democracy has matured the race issue has intensified, deepened, and become more problematic. It can still be expressed in the crudest possible manner, as happened last week when a white farmer in the Free State province dragged a black man - with a wire tied to his ankle - for five kilometers behind his pick-up truck. The black man died, yet another victim of all-too-frequent race murders in a liberated South Africa.” Justice Malala, London correspondent for the South African Sunday Times. I hope you have time to take a peek at Paste Magazine and do yourself up into a piece of artwork. Send me your images as you do them and I will collect and post them to this blog. Thanks to Speaperd Frairy we all have hope. 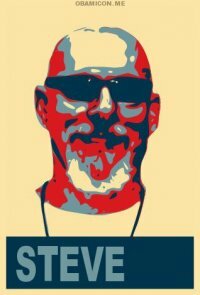 My Facebook friend Steve took advantage of the Paste Magazine Obomicon me web site and did a nice job on his self portrait. myartspace has been blogging for more than 4 years. We have a collection of hundreds of interviews, articles, and interesting nuggets of information about the contemporary art world. Due to some technical changes at Blogger, we've done some restructuring of our blog. Hopefully all will run well, but please do let us know otherwise. Online Art Galleries -- Who is represented by online art galleries and how has this changed the way art is collected and critiqued? If you go online and google “fine art online galleries” you will find a page filled with names of established galleries. It may be difficult to find a gallery that gives major support to the artist because a gallery is in the business to sell art and always has been. I thought I would find a different field of art and collectors on these types of web galleries, but I didn’t. In the galleries it is “business as usual.” For example, artnet.com says “The Network serves dealers and art buyers alike,” it says nothing about supporting artists’ ideas, works and talents. This didn’t really surprise me but for some reason I thought the internet would host a multitude of artists’ communities. Some of the work for sale on that site is antique art, design galleries and decorative art; however, there is no physical address for the site. It represents established galleries all over the world. I browsed through and looked at the online auctions to see what’s for sale. It was worth looking at the art and seeing the prices set for this online auction. Over 300 pieces were exhibited for sale with an auction deadline. This sort of auction is set up much like EBay were you submit a bid and wait for the deadline. I don’t know if works of art are flying off the virtual wall or not, but I do know after the show they won’t have to spackle and paint. This recent form of online gallery is not a new trend it is the wave of the future. I would like to say that the internet should be owned by “the people” but that is just my ideological way of saying there is no corporate enterprise gaining from its use. Well, I know that isn’t true but I like to think the mass majority controls what is important. When I get a chance to browse through art gallery sites I get lost in the individual pieces that relate to my inner senses. Don’t get me wrong, I love going to gallery openings and sitting in front of works of art contemplating. I get excited when museums bring rare arts I would never be able to see if not for the work of all the dedicated curators. Because I live on the West Coast of the U.S., I tend to look at sites where I may be able to visit if I just have to go see the work. The Los Angeles County Museum of Art site caught my eye one day and it had a large collection of images I recognized. I found a particular artist’s work I hadn’t seen in years. The excitement I had over discovering that he was still working in the same medium and had some recent work I could study, gave me a feeling of gratitude. The internet helps me discovery artist I know and opens my awareness to know works. In the past, I may have never been able to know such art and artists existed. The multitude of art sites gives me a chance to explore new and exciting spaces. Some of the most intriguing of my discoveries were on MYARTSPACE.com. A host of emerging, current and established artist peaked my interest so much one night I spent hours scouring over the works and being mesmerized by what I was viewing. Now, it only takes me a few minutes to find someone with ideas I can relate to by browsing on MYARTSPACE.com. I have found no other sites like this, and I am sure, the number of artists who post their work to be viewed by millions, give them a feeling of accomplishment and some much needed cash selling their own work. This site gives fine artists their own wall on a page as if it was their personal website and they get to show what is important to them. 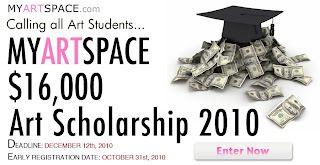 Thousands and thousands of artists can respond to the world with no huge entry fee. I fully understand there is nothing compared to viewing a physical piece of artwork but I can pinpoint works of profound creativity in just a few minutes. 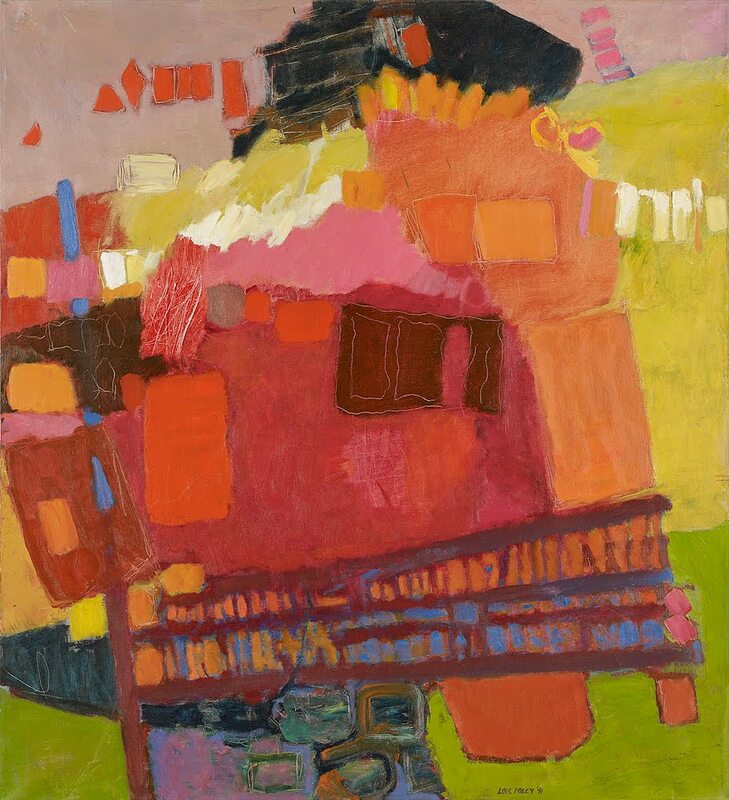 Sure, I can go the museum sites, gallery sites or sites like artnet to lull my senses, but nothing can replicate the sheer delight I have when I find a piece of art work on MYARTSPACE.com that is so compelling I just have to study it in detail. This is why I enjoy the intimacy of the internet, even though it is called the World-Wide-Web, I can view and linger as long as I want. Because of this connection I feel like I just tapped into the future. Having a site like MYARTSPACE.com is helping keep the “medium as the message” by giving to the majority of the artists critiquing the artistic relevance. What exactly does it take to create an artwork? What conditions need to be met for an artist to take ownership of an object? The precedent set by Duchamp seems to suggest that all an artist needs to do is to stake a claim to a thing, that the relevant part of artmaking is not the act of constructing an object, but creating an idea. Art history seems to confirm this claim, but is this valid? What and where exactly are the limits? Fortunately there's an iphone app that can help with these questionable cases of artistic identity. The pocket-sized program analyzes your photos and calculates if whatever you're looking at is, in fact, art. (Unfortunately this will be little help in with Segal case, who has prohibited photography of his pieces.) While this app might be the latest gag put out by the Pittsburgh based Mattress Factory, the tongue-in-cheek tech piece asks a larger and more serious question: to what extent is the label 'art' an interesting and relevant distinction? If the Duchampian vision of obliterating the line between life and art has indeed been successful - and we can argue with some conviction that it has been given a few colorful examples like living sculptures Gilbert and George - is there any sense in labeling something art at all? What, if any, are the limits of this? How about claiming someone else's art as your own? 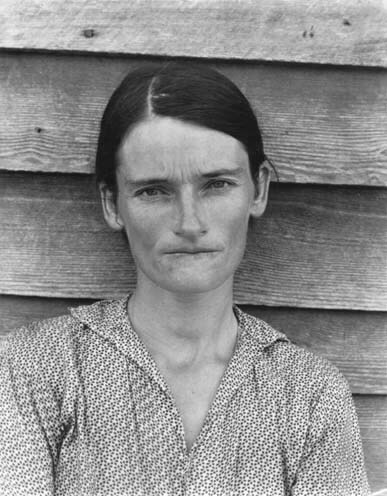 Sherrie Levine has made a career out of this, rephotographing Walker Evans depression era photos in the late 70's, and later reproducing Duchamp's Fountain in gold. Her move was repeated in the early 2000's by Micheal Mandiberg, who scanned both the Evans and Levine photographs and uploaded them to his website where they can be printed with a certificate of authenticity as original Maniberg's. What about having someone make every part of your work for you? Damien Hirst and Jeff Koons have been doing this for years, and while it may upset the likes of Dennis Dutton and Stuckism International, the art world at large seems to ask few questions about these objects. Call me young and naïve, but intuitively I'm still somewhat uncomfortable with an artist who claims ownership of other people's work. I certainly don't want to advocate throwing them out of the pantheon of art, but I think it's very important that we consider who actually made the artwork as part of the piece's conceptual core. Part of the value of Warhol's commentary was that he wasn't making his objects, and that they would have meant something different if he was. The question going forward is whether or not this same applies to artists like Jeff Koons, Gerhard Richter, Kehinde Wiley, or Tino Segal. Whether their participation, or lack of participation, in the creation of their artwork helps or harms the piece itself. HOW CAN YOU OWN @? The universal communication and internet symbol @ has been acquired by MoMA. When I first saw this news release I wondered how a museum could own a symbol in their collection. I went to their website, http://www.moma.org/explore/collection/architecture_design, and looked around. I didn’t find any other symbol like this that wasn’t attached to an overall image or model; however, I did find what the MoMA is saying about the @ symbol as an acquisition. MoMA’s Department of Architecture and Designs says the acquisition of the @ symbol means it is no longer a necessary requirement to have physical possession of an object. They acknowledge things that “cannot be had” because they are too big -- like buildings, airplanes and installations, but they go on to say the same criteria of quality, relevance, and overall excellences shared by all objects in MoMA’s collection also apply to these entities. So @ is sharing the same criteria as all objects acquired; but they are now called entities not objects. As I looked around on the MoMA website I didn’t see any other entities so widely used freely by the public. So if @ cannot be had, what is the purpose of having it in MoMA’s collection? The @ symbol is not an objet to own. So MoMa put the image of the symbol in the graphic design collection which includes typography, posters, and other combinations of text and image. I guess that @ fits into that category of art, but its free use is what makes it so important. I started to think about what other symbols have been so widely used in the world without, any sort of religious hinge, and I couldn’t think of any. @ crosses all lines of culture, beliefs, freedoms and attachment. Its free use is what makes it such a global symbol. When I looked up the history of @ on Wikipedia I found the most compelling part to be the computer history; Ray Tomlinson, American electrical engineer developed a computer system to send messages to different computers through his network. He noticed the underused @ symbol already on the keyboard. In 1971 Tomlinson appropriated @ to use for his first email. This is what makes this little symbol so important to the world? Anyone with a computer, cell phone or any other type of social, communication or information devise knows the importance of @. Maybe its acquisition by MoMA is to honor the @. I think most users already know this. Wikipedia had some ancient history on @ I found interesting but it is nothing like its use today. Thinking about how to collect an artistic idea made from an installation, performance or thought has proved to be challenging for museums and galleries. Taking a photo of these does not depict the moment in time when it happened. Tag the world? I guess to acknowledge things makes since. I wonder if this is going to start a new form of collection. What is the next symbol to be added to their collection?